Prior to Sql Server 2016 by default first 8 pages for the tables were from a mixed extent and subsequent pages were from an uniform extent. Microsoft in the versions of Sql Server prior to 2016 provided an option to override this behavior by means of Trace Flag 1118. If this trace flag is enabled, the first 8 data pages for the tables were also from Uniform Extent instead of Mixed Extent. This flag was helpful to avoid the resource contention issues, especially in the TempDB in the scenario’s where huge number of temp tables were created. 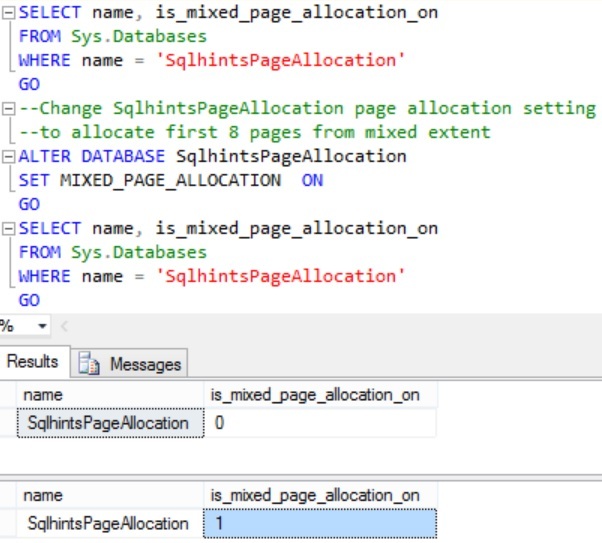 In Sql Server 2016, the Sys.Databases catalog view has an additional column is_mixed_page_allocation_on. This column value 1 means the database table will get the first 8 pages from the mixed extent and subsequent pages from the uniform extent. And a value 0 means all the pages for the table are from the uniform extent. From the result we can see that for the TempDB and user databases the mixed page allocation is OFF. 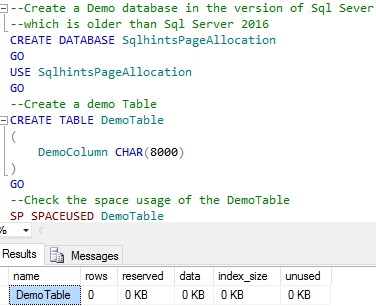 It means TempDB and user databases in Sql Server 2016 by default will have the page allocated from uniform extent. 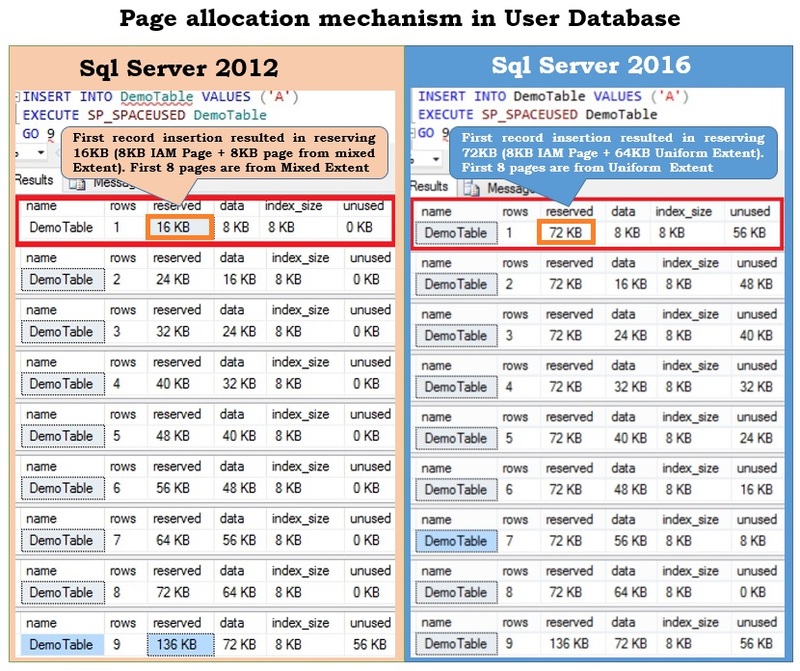 EXAMPLE 1: This example compares the page allocation mechanism in user database between Sql Server 2016 and the previous versions of the Sql Server. In one 8KB data page for data 8060 bytes is reserved. In the DemoTable, the DemoColumn is of type CHAR(8000) it means even when we store just one character in this column it will take 8000 bytes which is almost equivalent to 1 data page. So, we can consider 1 row in the DemoTable require 1 data page. From the above result we can see that when table is created initially no space is reserved for it. 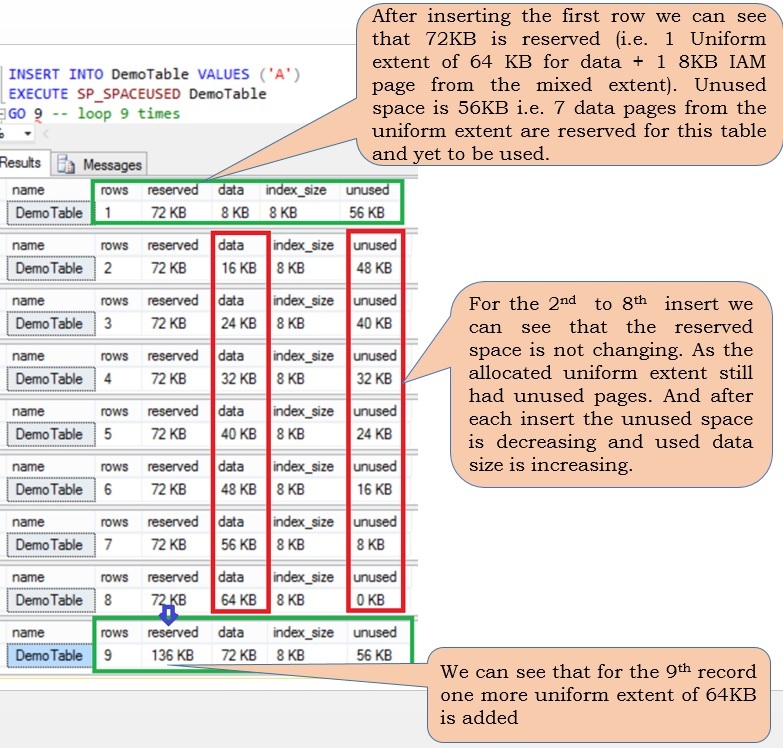 From the result we can see that insertion of the first record resulted in reserving 72KB space (i.e. 1 Uniform 64 KB extent + 1 8KB Index Allocation MAP(IAM) Page from the mixed extent). 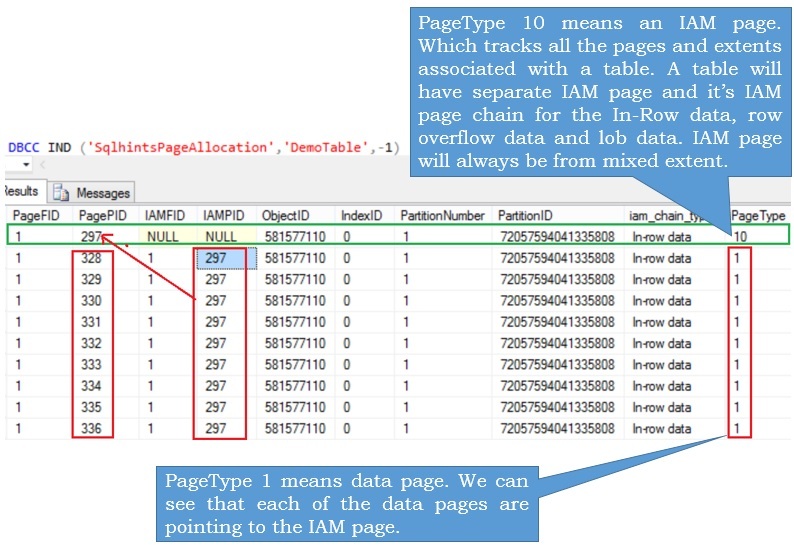 Each table will have at the least one IAM page, IAM page tracks all the pages and extents associated with a table. 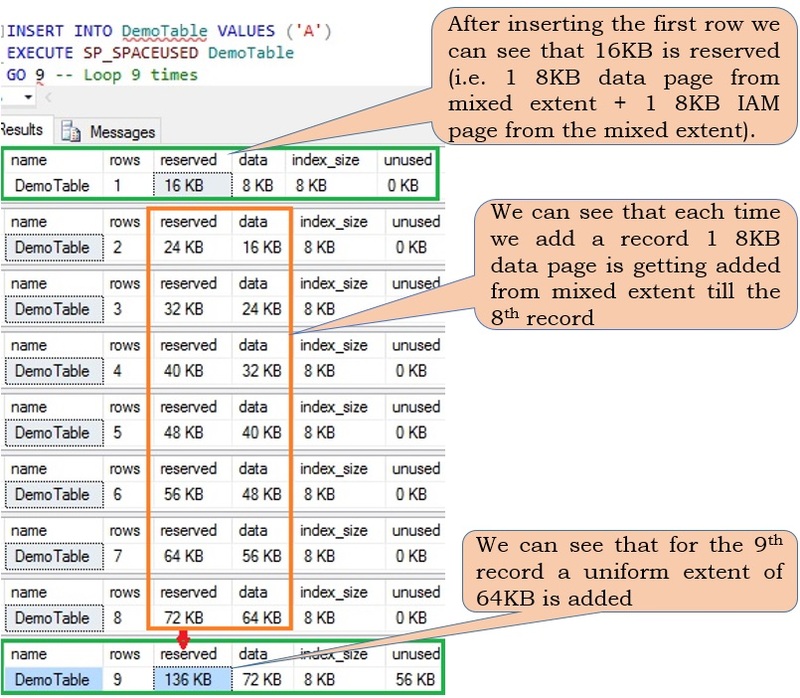 A table will have separate IAM page and it’s IAM page chain for the In-Row data, row overflow data and lob data. IAM pages will always be from the mixed extents. 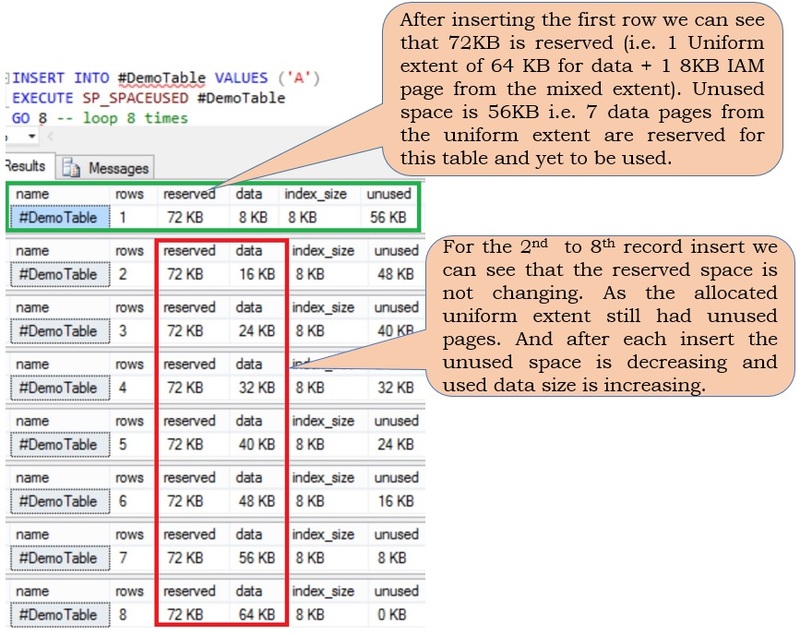 Insertion of the 9th record resulted in the allocation of one more uniform extent, because that after the 9th record insertion we can see that reserved space is 136 KB( 72 KB + one more 64 KB uniform extent). Execute the following un-document statement to get the all the pages associated with the DemoTable. Please don’t experiment any of such un-documented statements in the production environment. From the result we can see that DemoTable has 10 pages (1 IAM Page from mixed extent + 9 Data pages from the Uniform extents). 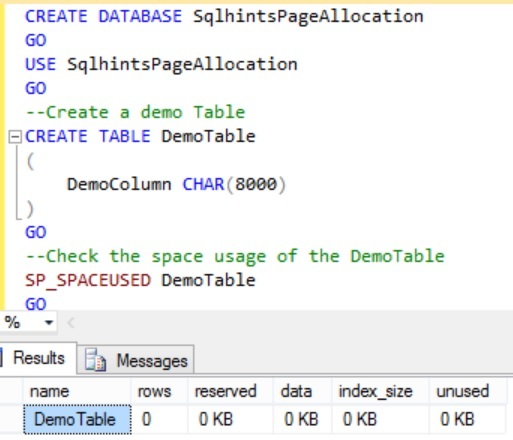 Execute the following statement to Create a demo database SqlhintsPageAllocation with a DemoTable table by executing the following script in the versions of the Sql Server older than Sql Server 2016. I am executing it on Sql Server 2012 instance. From the result we can see that insertion of the first record resulted in reserving 16KB space (i.e. 1 8KB data page from mixed extent + 1 8KB Index Allocation MAP(IAM) Page from the mixed extent). 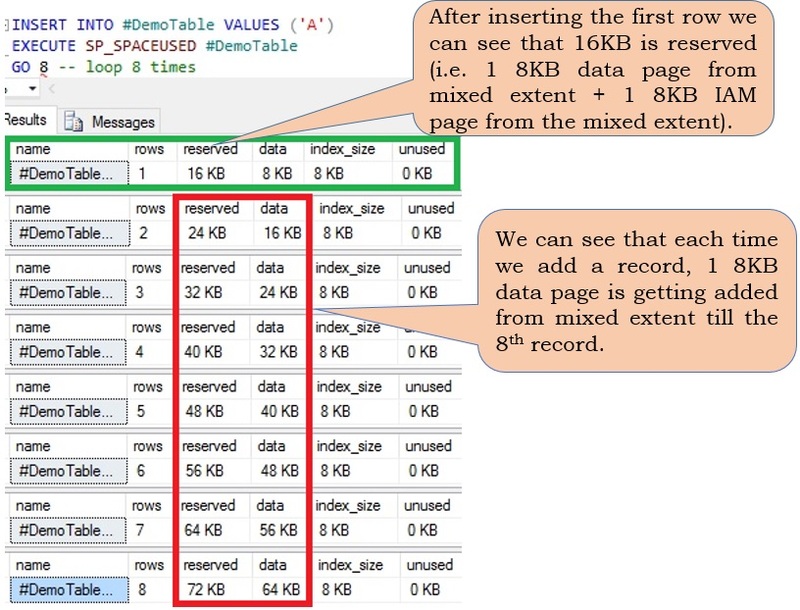 For each record insertion till the 8th record one 8KB data page is allocated from the mixed extent. Insertion of the 9th record resulted in the allocation of one more uniform extent, after the 9th record insertion we can see that reserved space is 136 KB( 72 KB (previously alloated space) + one more 64 KB uniform extent). From the result we can see that DemoTable has 10 pages, one 8KB IAM Page from mixed extent and 9 Data pages (8 Pages from mixed extent and 1 page from uniform extent). 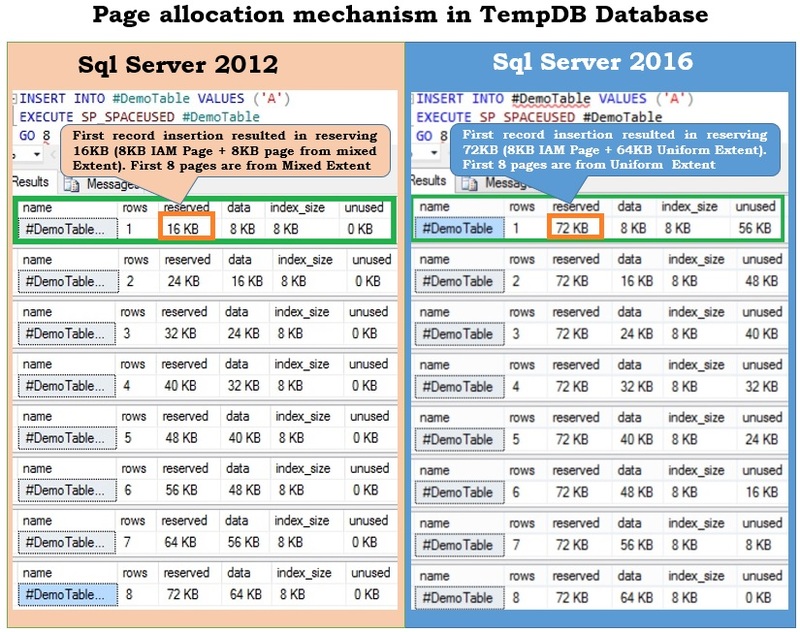 EXAMPLE 2: This example compares the page allocation mechanism in the TempDB database between Sql Server 2016 and the previous versions of the Sql Server. In one 8KB data page for data 8060 bytes is reserved. 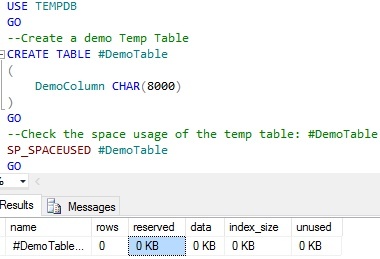 In the #DemoTable, the DemoColumn is of type CHAR(8000) it means even when we store just one character in this column it will take 8000 bytes which is almost equivalent to 1 data page. So, we can consider 1 row in the #DemoTable require 1 data page. From the above result we can see that when table is created initially no space is reserved for it. 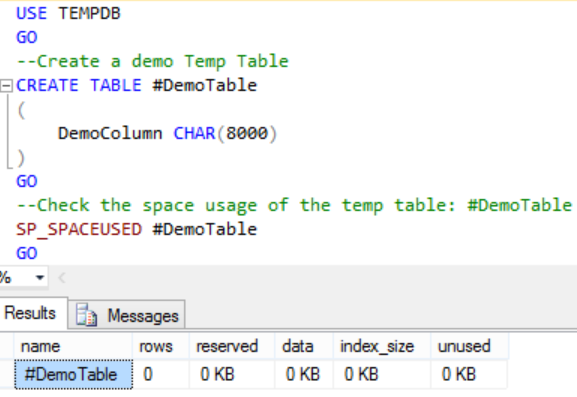 Create a temporary table #DemoTable table by executing the following script in the versions of the Sql Server older than Sql Server 2016. I am executing it on Sql Server 2012 instance. 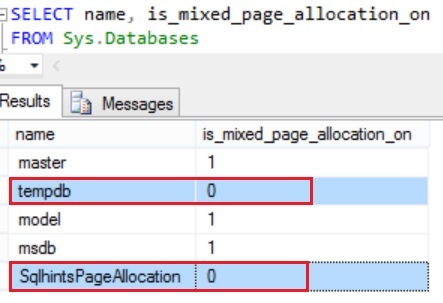 Option ‘MIXED_PAGE_ALLOCATION’ cannot be set in database ‘tempdb’.